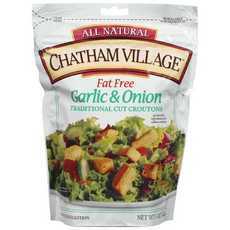 Enjoy Chatham Village Croutons Garlic & Onion. The Tradition Started Years Ago In A Small Sandwich Shop In Chatham, Massachusetts, Located At The Elbow Of Cape Cod. The Baker's Goal Was To Make The Freshest, Best Tasting Croutons In The World, Using All-Natural Ingredients. Chatham Village Croutons Are Unique Because They Are 'Baked-Twice'. They'Re Made From Freshly Baked French Bread Which Is Cut Into Tasty Morsels. Then The Croutons Are Seasoned With A Special Blend And Baked Gently To Create A Delightful Combination Of Flavor And Crunch. (Note: Description is informational only. Please refer to ingredients label on product prior to use and address any health questions to your Health Professional prior to use.